One of my favorite parts of going on a vacation is reliving that vacation when I get home. The memories, the photos, the laughter, the food: All of these things are what makes a vacation so special. Whenever John and I travel, we look to eat some unique food. Cuisine we can't get our hands on 'back home'. I approached Caribbean Trading Company about sampling some of their Made-in-Puerto-Rico seasonings, sauces, and speciality food items. Who doesn't want a little taste of Puerto Rico on their dinner table at night, right? 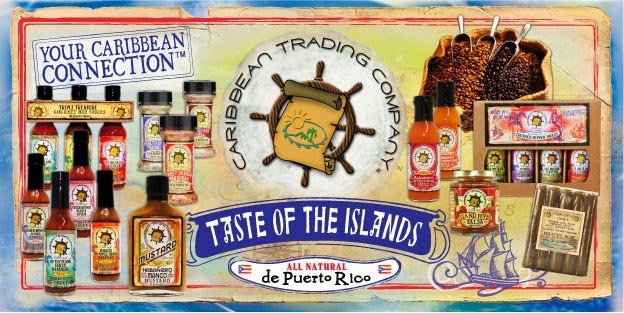 Caribbean Trading Company has a large variety of Puerto Rican seasonings, two of which I was able to try: Lively Up Lime Jerk and Sweet Orange Habanero. Gather the main ingredients for this dish - romaine hearts, a handful of fresh spinach, and medium deveined shrimp. Then, top the romaine hearts and spinach salad with your shrimp. I chose to add a quick grating of a chipotle cheese we had in the fridge for some extra heat. We also included a little balsamic vinaigrette on the side, but didn't use it. 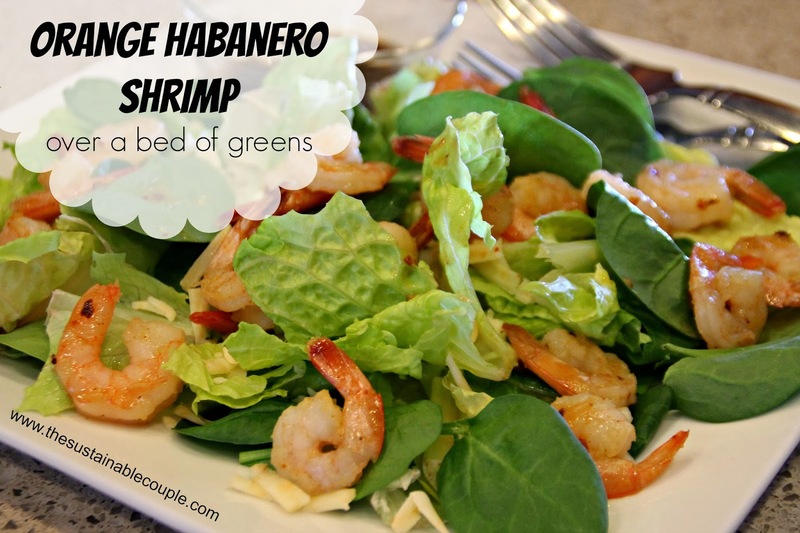 The shrimp were so flavorful from the Sweet Orange Habanero seasoning, and it dressed the greens very well. The heat from the Sweet Orange Habanero seasoning was spot on! The orange part of the seasoning was apparent, but not too overpowering. For shrimp or seafood in particular, I like the citrus flavor. If I used this on chicken or veggies, I don't think it would have been as appealing. I used the Lively Up Lime Jerk seasoning on a roasted, whole chicken. Tomorrow I'll share the dinner recipe! My lunch and dinner ideas aren't the only way you can use the seasonings, and there are a TON of authentic Puerto Rican products available. 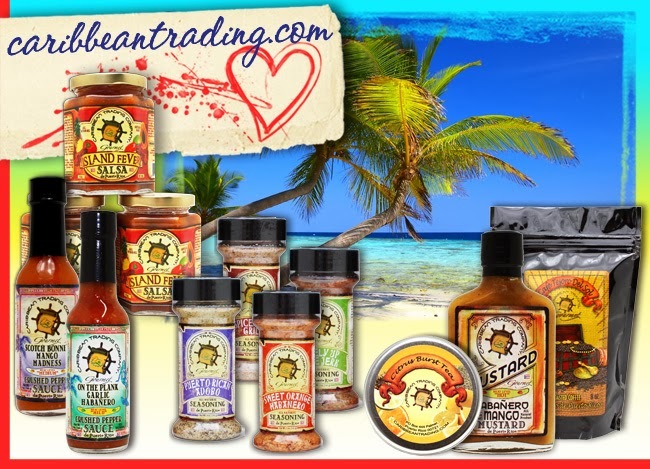 (Click HERE for a list of all the Caribbean Trading products.) Curious what you can make with the various seasonings and rubs? Click HERE for Caribbean Trading recipes. I want to try the Lime Jerk! I would go for the orange habanaro! Sounds so refreshing. Both are this awesome combination of sweet, citrus, and zing! I hope you win! I would definitely try the Lime Jerk, it sounds fantastic! I recently found your blog and have enjoyed reading it as a fellow eastern Iowan! Thanks, Kristina! Where are you from, if you don't mind me asking? We're in the Cedar Rapids area. I can't wait to try out the Orange Habanaro seasoning! Yum! I'm pulling for a "W" for you, girl! The lime jerk sounds wonderful! I would definitely be using it on some fresh seafood! They both sound really good. I'd hope that I could find a great recipe to try out or maybe have you give me some pointers! You guys would like them both! And, they're not too spicy that Alex couldn't eat it (which is always a plus, right?!). I'd love to use the orange habernero since I like things spicy and make that shrimp salad. The Lime jerk sounds good -- I would make some kind of chicken dish with it! The orange habanero sounds awesome!